David Debbage offers a short presentation on a different topic each week before supervising a duplicate session for improvers. The session starts at 1.00pm and during 2018 has maintained a regular loyal following. This continues to grow and be successful – attracting both established players and some of the newer members. There are three different competitions each year held on a Monday night – all keenly fought. From January to the end of April we hold the Geoff Nuttall Trophy which is awarded to the best performance by an individual player which in 2018 was won by David Sarabowski. 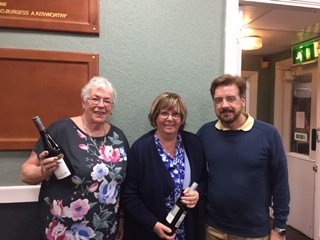 From May to the end of August we hold the Tony Wood Memorial Trophy for pairs and in 2018 it was won by David Sarabowski and Lesley Johnson. Our oldest events, the Cheadle Royal Cup was held from September to the end of December 2018 and was won by Stephen Ward and Chris Hine. During the course of 2018 the format has been a short lesson followed by a supervised duplicate session. 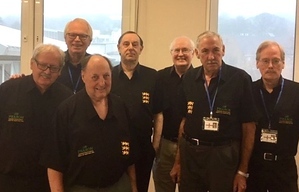 Numbers have dropped off as players have moved on to other sessions but the graduates of Dave Debbage’s beginners sessions and less experienced players returning to the game are finding this format most helpful. Josh Clarke does the supervision. Wednesday night has traditionally been the night where you will find some of the club’s best duplicate players and the results of the best 21 performances on Wednesdays decides the winner of the Club Championship. 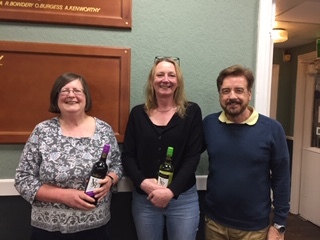 In the year ending 30th April 2018, Eve Lighthill was winner of the Club Championship. During 2018 it was nice to see some of the less experienced players join the sessions and it is essential for the continuation of our flagship duplicate that more such players support it on a regular basis. The introduction of Swiss Pairs on a Thursday night has proved one of the club’s great success stories. Regular turn outs are between eight and ten tables. From January to May players compete for the John Bird Memorial Trophy which was won for the third year running by Nicolas Greer. From October to the end of December the Trophy played for is the Merton Cantor Cup donated by one of Merton’s former team mates, Bill Atherton and this was also won by Nicolas. The club continues to encourage less experienced players to participate in the Manchester League and in 2018 a good proportion of the teams in the bottom two divisions came from the club. The club also organises a number of teams’ events during the course of the year. The oldest events are The Ruia Cup held once a month over May, June and July and The Eve Lighthill Trophy held on three Thursdays in September. In 2018 the Ruia was won by Eve Lighthill, Sid Travers, Elena Rosenbaum, Marcello Rosenbaum and Bob Cooke. The 2018 Eve Lighthill Trophy was won by Sam Herman, David Evans, Stuart Shalom, Mike Clarke, Irving & Joy Blakey and Peter Jones. The other teams’ events we organise are the Michelle Brunner Memorial Charity Event which is a Mixed Pivot Swiss Teams and the Martin Braid Memorial Event which is simply a Swiss Pivot Teams. In 2018, the winner of the Martin Braid Memorial Event was Ollie Burgess’s team (Alan Mould, Adrian Kenworthy, Rob Myers and Ollie) and the best placed non expert team were David Tilley, Wei Che Tham and Daniel Kelsall. The Michelle Brunner Memorial was won by Jeff Smith, Jackie Pye, John Holland and Alan Mould. The best placed intermediate team was Iain Mackie, Hilary Boydell, Rose Davenport and Simon Townsend. The Michelle event attracted 16 teams and £1860 was raised and donated to Christie Hospital and St Ann’s Hospice. Fifteen tables took part in the Martin Braid event which had prize money sponsored by Susan Braid. A raffle at the Martin Braid event raised £500 for the British Heart Foundation. Most afternoons there is usually a game or two of Chicago with stakes of 50p and above. 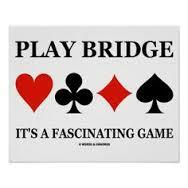 With duplicate players coming up to retirement age, playing Chicago is a way of getting a good standard bridge game in an afternoon with a scoring system similar to duplicate. 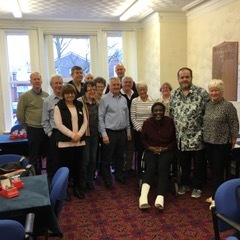 We have a lot of improvers in the club and many are keen to attend Ollie’s workshops on Sunday afternoons which have proved extremely popular during all of 2018. This is the Club’s Annual Open Christmas Event played over two sessions with a famous Christmas buffet at the interval. For the last weekend event at Palatine Road eleven tables took part. There was a good standard field and the winners in 2018 were Irving and Joy Blakey. Dan Crofts and Ollie were second - maintaining Dan Crofts incredible record with two wins in 2017 and 2016. A one session pairs for this trophy in memory of Peter Ader was won by Martin Taylor and Justin Hackett on the last Wednesday before Christmas 2018.